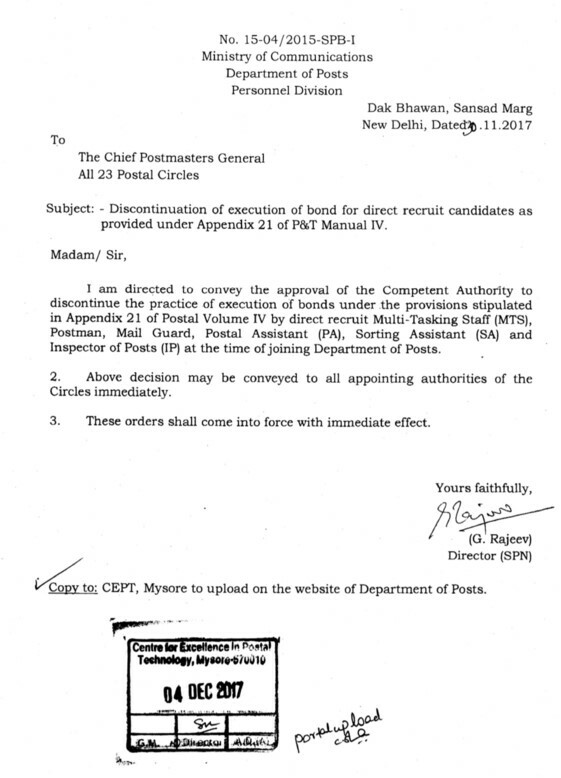 I am directed to convey the approval of the Competent Authority to discontinue the practice (of execution of bonds under the provisions stipulated in Appendix 21 of Postal Volume IV by direct recruit Multi-Tasking Staff (MTS), Postman, Mail Guard, Postal Assistant (PA), Sorting Assistant (SA) and Inspector of Posts (IP) at the time of joining Department of Posts. 2. Above decision may be conveyed to all appointing authorities of the Circles immediately. Copy to: CEPT, Mysore to upload on the website of Department of Posts.